So, I'm in week 1 of a software development course, Myself and 20 others are here in Edinburgh at a facility called Code Clan. We are here on a software development boot camp, where in a fairly short space of time (16 weeks) we will (hopefully) gain a Professional Development Award (PDA) in software Development. So far a big thumbs up, great facility, enthusiastic instructors and 20 other friendly cohorts (my class mates). I am in Cohort7, which is the seventh time this course has run. Sounds a bit like a space mission. "Welcome aboard Cohort 7, your journey to the future"
Day 1 - was mainly an induction with a meet and greet in the morning along with lots of info and a few ice breakers. The afternoon saw us dive into Unix command line, Git and Git hub version control system. Ive used Unix before briefly and have experience of a version control system. Getting instruction refreshed my memory and taught me the basics of Git. Day 2 - starts with an Agile Scrum (standup), we all meet at 9 and discuss what we did the day before and go through any problems we have and then its off into the class room. 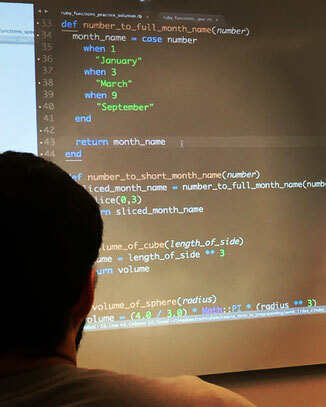 The classes took us into the world of Ruby, with functions, methods, and conditional statements; a software engineers buzzword bing0 dream. This lead us on to start writing some small programs and later in a Lab exercise start to use Test Driven Development (TDD) methods. Day 3 - We started again with an Agile Scrum at 9 and went through the previous days work. Then back into the classroom for more Ruby (Arrays and Hashes) and some exercises which included the hulks super powers. Apparently he has a smash power of 100. Day 4 - Im getting into the agile scrum thing now. Its a great way to start the day. Morning is spent in class exploring better use of text editors and also applying debug methods to making your code work. Afternoon is spent in labs going through examples and putting into practice what we have learnt. we were split into pairs which helped with speed and lets you bat ideas between you. This is a Thursday which means social evening and Cohort 6 have laid on a pub quiz night. Day 5 - Friday, I've made it to the end of the week... Go me! So Friday there is no lessons and an opportunity to go through anything you have not quite understood from the week before. and... you get your weekend homework. So top marks for Code Clan, the teaching methods, the instructors and fellow students!!! Very readable summary of your first week. I know someone in Cohort 6 so it's nice to find out what they went through. It's good to hear you're finding week 1 as useful as I did. Stick at it and I can guarantee that you'll be surprised at not just your progress, but the progress of your fellow classmates.